Two weekends ago we painted the master bedroom which just about killed us. Then last weekend we started working in the yard which was very much needed. All the bending, trimming and putting out eighty bags of mulch just about did us in. I keep telling my husband that eventually we need to let the younger stronger ones do this. He hates to pay anyone to do what he can still do. He said he's keeping me young. I'm not so sure. 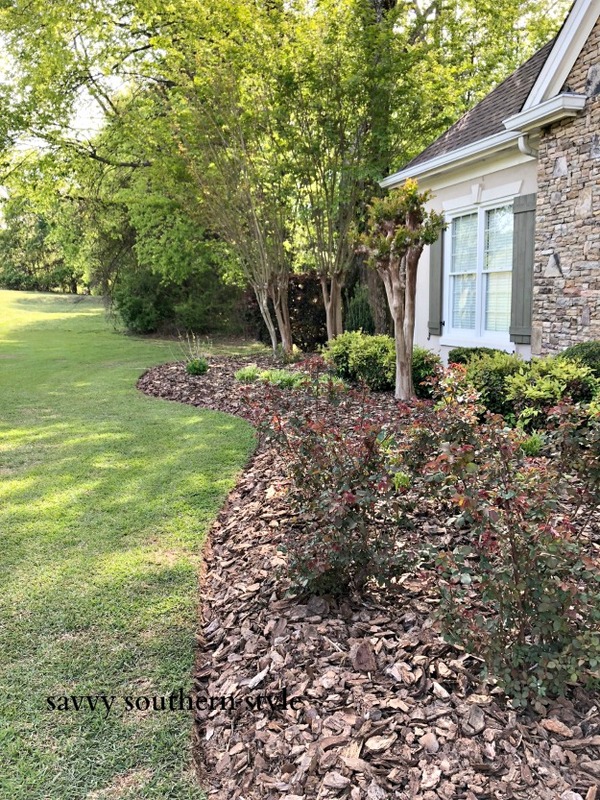 Last April I shared the yard after we put out a few truck loads of large bark chips as our ground cover and it looked nice until recently as it turned silver over time so this year we went back to the brown mulch. This is how it was looking when we got started this year. The rain storms we have had had washed a lot of the bark away so it was really thin in spots. I normally trim the lirope back, but my lightweight trimmer has quit working and we have a heavy gas trimmer so the mister wacked back all the plants We should have done this a bit earlier in the year as the new growth is alreay coming up. We have lots of lirope, or monkey grass as we call it, and I used to cut them by hand with clippers. We planted this twenty three years ago and a lot of it is transplants from our first house and those were transplants from the house I lived in before getting married. 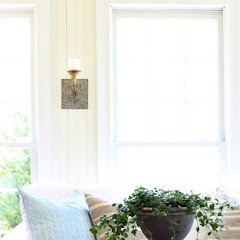 These are so easy to divide and transplant and they do very well. 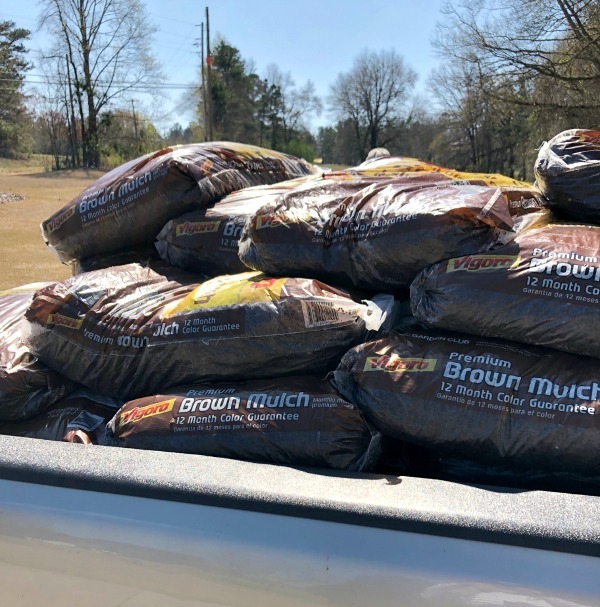 Home Depot had this mulch on sale and we have used it before. Everyone in the truck line was getting this loaded. This is the first fifty bags and then we went the next day for thirty more. We still need to get more to put out on the large island in our yard. I used to work outside from morning till dark, but I just can't do it anymore. This is how it looked after we finished. The rose bushes were cut way back as they will grow back so quickly. 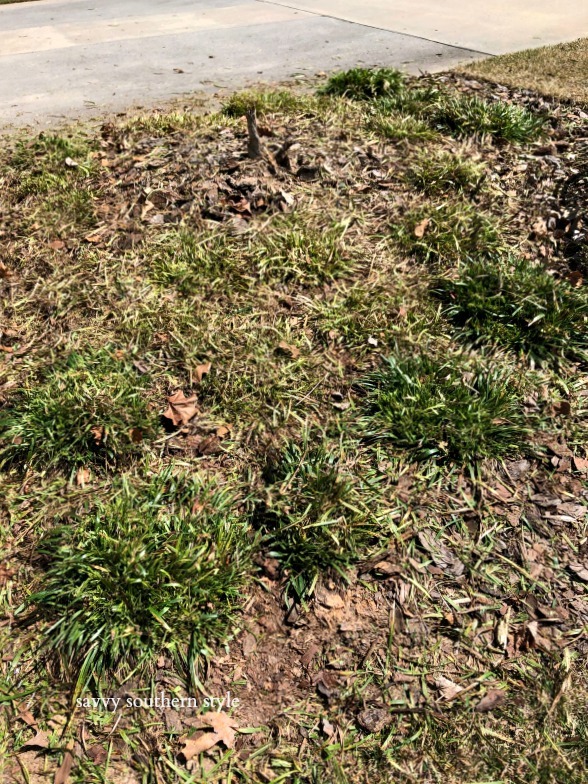 The monkey grass will push on up through the mulch. 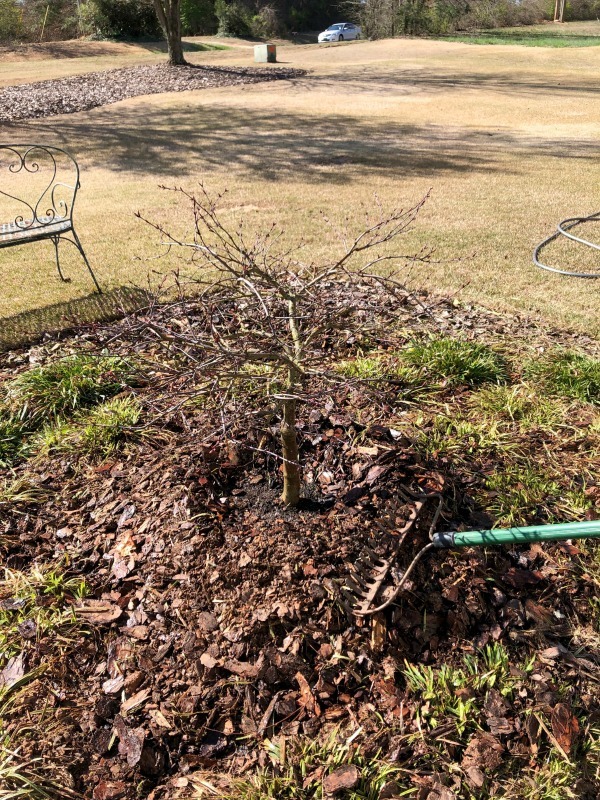 The old tree that has been here for many years died so we replaced it with a Japanese maple. These little trees are pricey so I hope it does well. A week later and the leaves are beginning to open. The rose bushes are growing and the monkey grass is getting taller. Now we just wait for the grass to get greener and for all the plants to grow and fill out. The pollen is so heavy right now. How about where you are? Don't forget to follow on IG. I've finally given in and pay to have the heavy work done by younger, stronger people. Speaking of Japanese maples, my sister and I barely escaped the garden center without a coral bark one this week. So pretty! Hope yours does as well as our less expensive ones have. We were looking at Japanese Maples yesterday while at our local garden center. We didn't get it, but are still thinking about it. Your work payed off! We put gravel all the way around our house about a foots width and then the mulch. Yes, less weeding and hopefully no termite issues. Looks good. Mulching is next on my gardening list right after I plant my caladium bulbs. 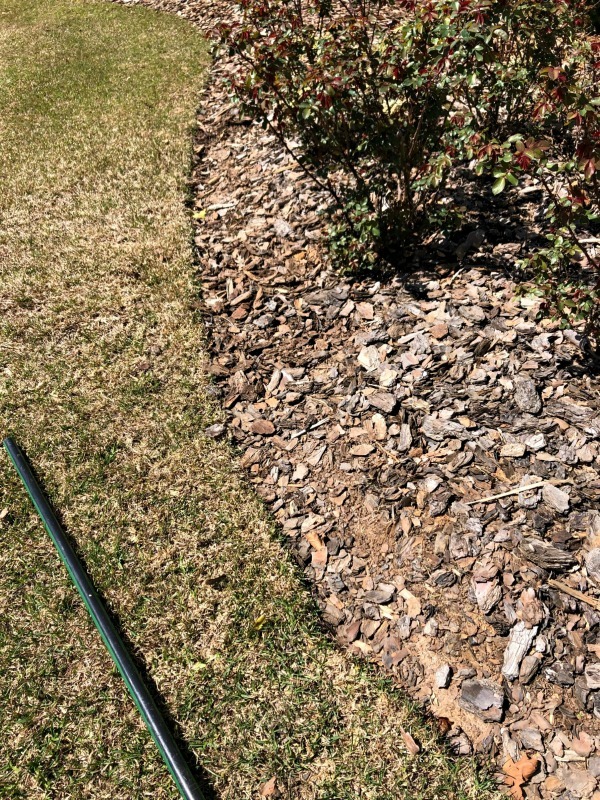 Do you apply your new mulch on top of your old or do you pull up the old? I have applied my mulch over my old and it has gotten quite packed. So, this year I pulled up all the old. It was quite a job. We put it over it this year. Every few years we start over. All of your hard work paid off as it all looks so beautiful! It will even be more beautiful soon! Your husband sounds like mine! LOL! 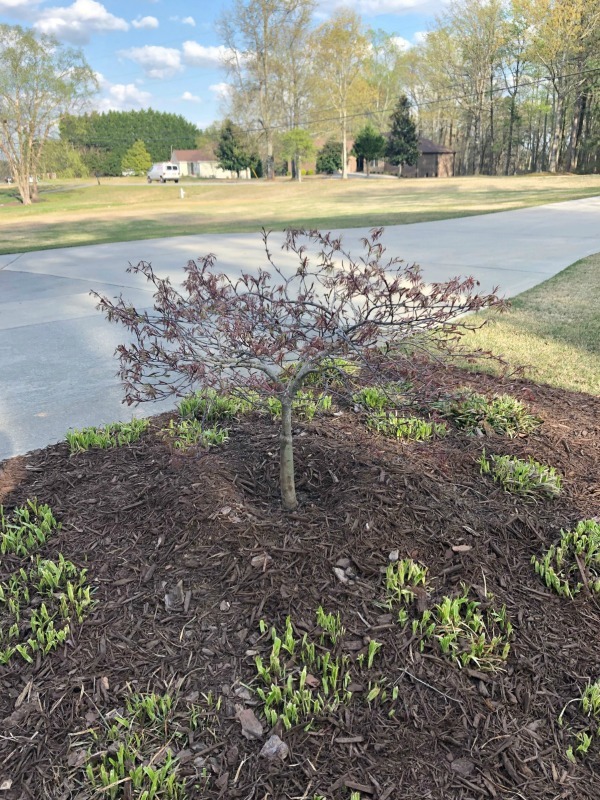 We planted 4 red buds this week. I love puttering around with planters/containers, but the huge gardening scene is getting beyond us! 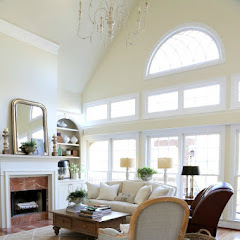 Kim, I love the spaciousness of your property. Our home is on a large lot and we have many trees and shrubs for privacy. Yet, we are close to shopping, restaurants, etc. 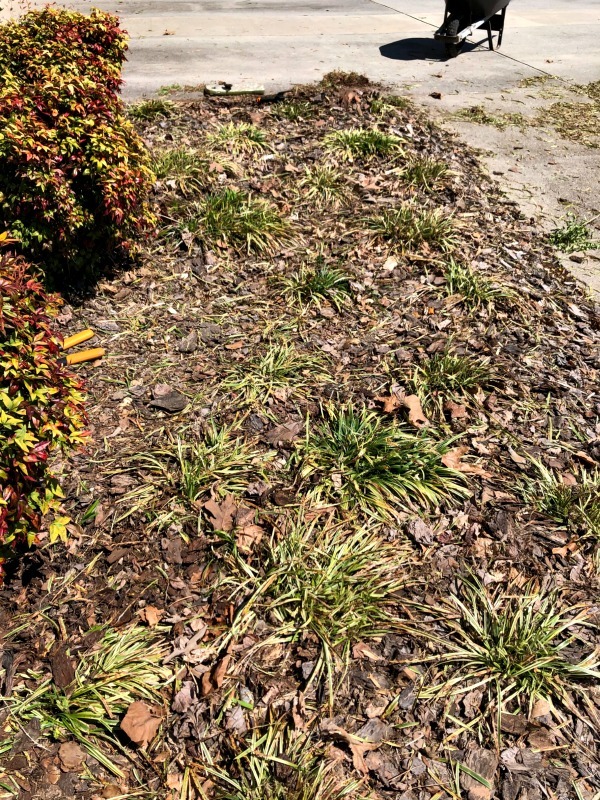 A realtor told me that many people, even younger couples, don't want yards that require upkeep; they much prefer homes with no yards to speak of. I'll keep my property as long as I am able! 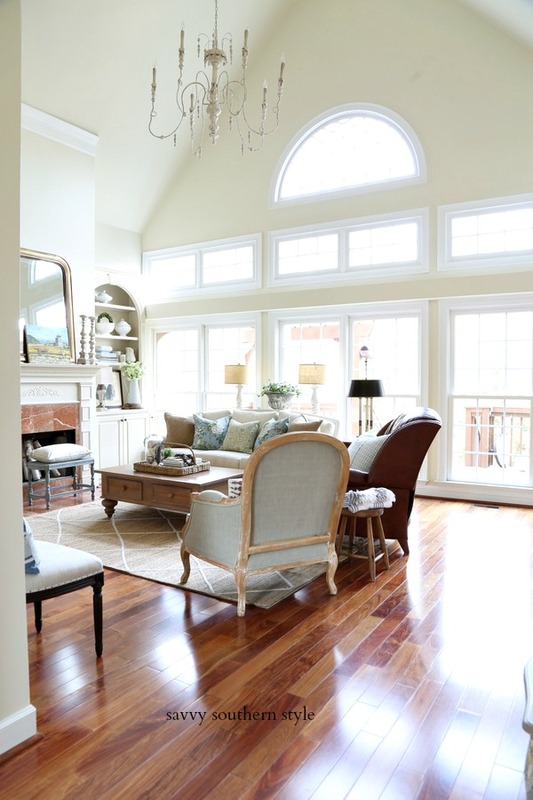 Your home is lovely inside and out. My hubby is the same way...he hates paying out money for things he can do himself. He just turned 65 and I know there will be a day he cant do a lot of things but for now unless its dangerous I let him tackle the jobs he can. Pollen is just starting in our area (central VA)and I dread it! 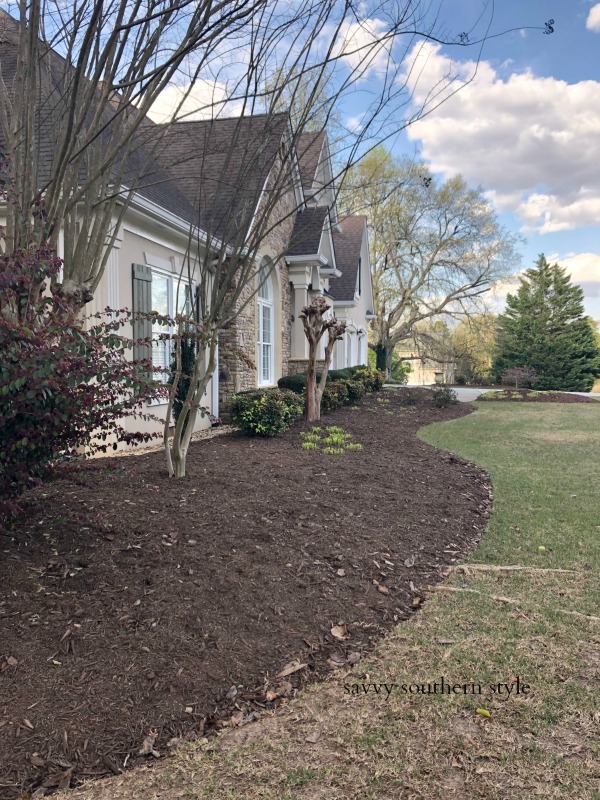 We also put out mulch on Friday and only have a side shrub garden to do. 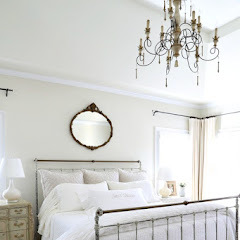 BTW...I absolutely love your new bedroom paint color and bedding. Its my favorite transformation to date! Hi Kim love your yard, but I have a small ranch (house and single story thankfully!!!!) now and LOVE it, I do have grass out front and pay someone to come every other week, I cannot mow anymore either! The concrete jungle is out back with the hole in the ground full of water, another pay but I use it and love love love it especially when it is 117 deg here in my neck of the woods! The pollen where do I begin? picture a 4 yr old crying to go outside and play in the dirt or just play in general......but can't because they can't breathe! THAT's what I feel like for this whole month of Feb and March! Yikes! good luck to you with this Spring Fever season! I'm SO tired of it!And I forgot to start my allergy stuff in January, go figure lol! it sure is a lot of work but so satisfying at the end of the day and you look back at all you have done. 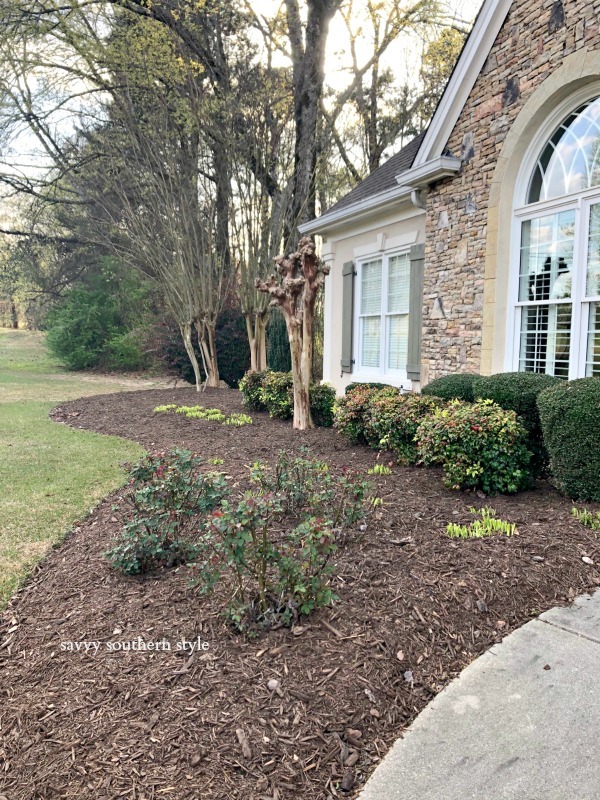 We use pine straw mulch. Works great, looks good and you don't have to worry about termites. Hardwood mulch attracts termites. Love Japanese maples. We have two and they are so easy - just a little pruning every now and then. I want a weeping redbud!! And another pink dogwood LOL. Dogwoods are just starting to bud out here. The dogwood festival will be soon!! Gorgeous weather here although it's cold today (could this be "dogwood winter"??). A big warm-up by week's end! Kim, everything looks wonderful - as usual! 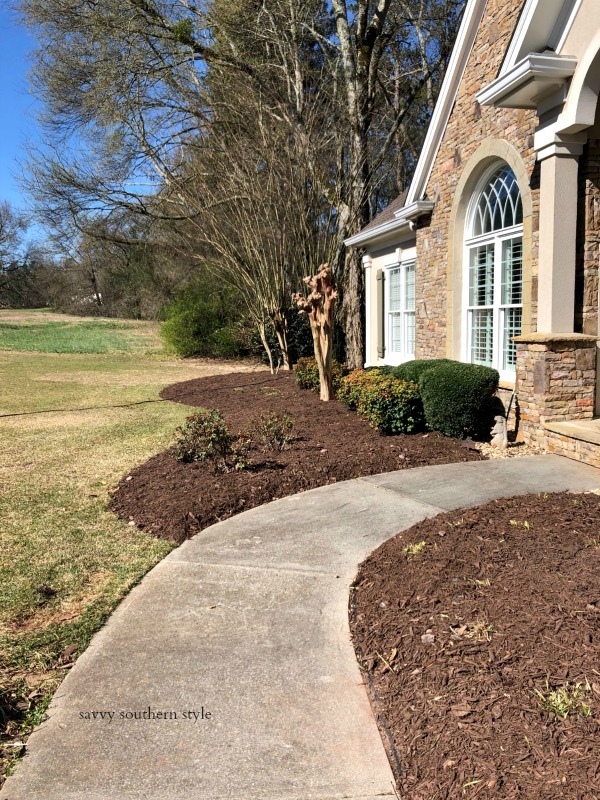 We live in East Cobb and also put down brown mulch. Did you know that you can buy the dye fairly inexpensively and spray it on when the sun bleaches it out? On a separate note, I need your advice! 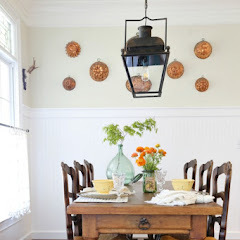 We're redoing our kitchen this year and I'm looking for a small antique pine chest of drawers. Do you he any suggestions of where to look nearby? Thanks! I will have to tell my husband there is a spray on dye. He always says that's what he is going to do and then we just buy more mulch. About the only place I look for antiques is Queen of Hearts in Alpharetta and the Lakewood 400 flea market which I have not been to in ages. Thanks! I haven't been to Lakewood either. Sounds like a visit is in my near future! It's still too cold here in the Northeast for pollen to emerge, but we'll get our fair share in mid-May to early June. Not fun, but it doesn't last too long, fortunately. I just came back indoors from shoveling up (yes, shoveling, not raking) 3 months' of spent sunflower seeds from the bird feeders. I feed more squirrels than birds when the snow covers the ground here. I don't mind during the winter, but I draw the line at the first week or so of Spring since the snow is gone here now. I've done my part for the wildlife, it's up to Mother Nature to take over until next winter. I still have the usual residual leaf pick-up/clean-up on the lawn (leftover from last fall), so I need to do that before the grass starts to re-emerge in the warmer sun, but I'm starting to think it's time for someone else to take over the lawn maintenance around here. 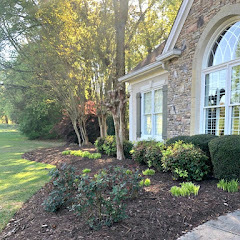 Your landscaping looks so nice...I'm inspired just seeing it in your photos! Your weekend sounded like my weekend! I used to work outside from dawn till dusk as well when I was younger and stayed home with the kids. Now I work, blog and can't be out in the sun as much. We got a late start this year too. I am hoping to get to the mulch in the next couple weekends! I feel the same way. 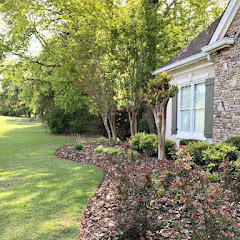 Our mulch in the front and sides of the house is still good from last year but we need to add mulch to the flower beds in the back. It is such a chore. At least that won't be 80 bags!!! We did 70 in the front last year and I was sore for days. Next year we might have to hire it out but I do agree with Mr. Savvy, it keeps you young...you know what they say, "Use it or lose it!" Ha! I was so glad to read the tip above on the mulch dye. I just ordered some from Amazon! I wish I had known about this before! Three tree stumps generated a huge amount of mulch which is so heavy and now I won't have to move much of it. Yeah! !